Discussion in 'News and Announcements' started by Roshen, Sep 21, 2015. Time-Locked Expansion server players rejoice, because you'll get 35% Off items in the Marketplace until noon PDT* on Thursday, October 1, 2015! Filly67 and HaphazardAllure like this. Why no bonus on Normal servers for this? Rage rage rage. Second class citizens, favouritism, lots of criticisms. Ok, I was messing, but called it first! Prissetta, dngrmse, Siren and 4 others like this. 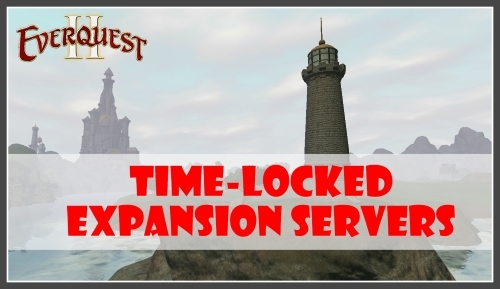 “Time-Locked Expansion server players rejoice, because you'll get 35% Off items in the Marketplace until noon PDT* on Thursday, October 1, 2015! Is this 35% savings or 65% Profit? “Why no bonus on Normal servers for this? I know you are messin E but this strikes a nerve with some of us. If we want anything on TLE we have to spend money for it. No holidays, no events, no Hey thanks for being great customers. And Im sick to death of the ..go back to Live if you want all this. Well in all honesty that is what most people voted for. Considering I really doubt they'd roll back most events so even if they put them in you wouldn't be able to even do them. Most holiday events take you to zones that are not available on TLE. Most holiday events started very early on in game. We didn't vote for no holiday events ever, we were told it wasn't possible. I call rubbish. The very first Frostfell was in December 2005. The quests should be reworked, and introduced at least by next year. I am guessing it's been left too late for this year. Whats wrong with blocking off zones that arent available and open them when they are..gives us something to look forward too. I'm aware I've played eq2 since its original beta, however, the holiday events have evolved and 90% of quests during holiday events no longer take place in ONLY vanilla eq2. Frostfell has EoF zones, Halloween has Loping plains, etc etc. Given the fact that these were changes made to the original quests themselves as well as new quests added in to the holidays it makes it much harder to roll back and make it available. If they did people would then just complain that there is only one quest they can actually complete and the rewards may not even be usable at current level cap (It's been a few years since I've seriously grinded holiday events). Really, it's a no win for DB, and I really hate defending them on anything. I do, however, see why it's not viable. When does this start? I just checked and everything I saw was normal price. And if this works just like the 10% that subs get, will we actually be getting 45% off, or is this actually a 25% off sale? we could at least get city fest in the areas that we do have , or moonlight enchantment same thing the areas we can access. I got piles of city tokens and nothing to spend them on. “When does this start? I just checked and everything I saw was normal price. You need to pick the item, click on buy and then you will see the 35% discount prior to actual purchase. So live servers get double xp weekends and weeks. We get a discount on vitality potions yay. Did anyone get that discount? I bought a character slot, saw 35 discount announcement there, but got the usual 10% one. So it's actually a 25% off sale, as we already get the 10%. yea, I thought it was kind of fishy with their wording, making it act like we on the TLE servers get 35% off items, when you have to be a sub to be on TLE anyway, which already gives us 10% off, so it's more like 25% gain. So, the amount being charged is more than what the game says it will. I bought a potion of amnesia (3 of them actually) to change some toon names on Stormhold. The marketplace window says I'm paying 617 DB cash per purchase, but when I look at my account wallet, 855 DB cash is being deducted for each one. Please adjust! yea they really need to fix the prizing . freshly logged in to game now and bought actor DB300.00, it told me total of 195.00 but it took of 270.00!!! I had 900 cash in there, got left with 630. I was told to relog (what??) so I DID. Went to market and bought a building block worth 10 cash. Checkout told me I am paying 6DB but after hitting buy I was left with 621 DB now. How is that 35%? It looks like it's only giving us the 10% discount, even though the purchase confirmation says 35%. I did not realize this was bugged and was so excited to decorate today and by stuff yesterday for my new alt. I spent 3648 yesterday should have gotten charged 2371. Bought 1765 today should have gotten charged 1147. Instead I got shorted and am now 1350 lower than I should be. As a launch day vet this is not ok, this is real life money they are shorting us on. I put in a ticket and am hoping they fix it as I did want some other things from the store before the sale ends. PLEASE fix this and reimburse us.